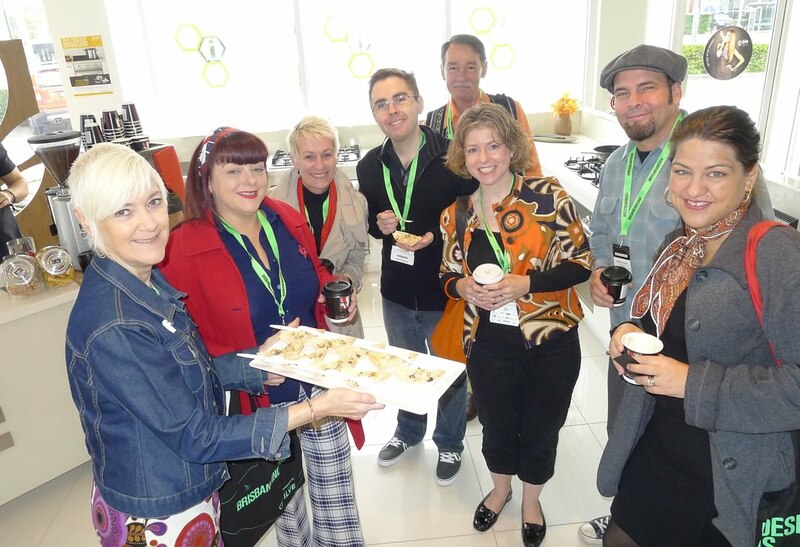 The Australian Modern team started at the ILVE showroom at Coorparoo for Brisbane Indesign. A special thankyou to the delightful ILVE staff for their hospitality, and a wonderful breakfast and coffee selection. We decided to park and take the free shuttle bus into Fortitude Valley, and then continue with a walking tour of the showrooms. Living Edge had a stylish display of new and classic designs, and the dispensing machine with ‘ Keep it Real’ badges speaks volumes about supporting original design. A novelty display was the mini cork chair competiton, constructed from Chandon champagne corks, some of our team were thirsty just thinking about it. Luckily the next stop wasn’t far away, Smeg had set up a bar in the Coco Republic showroom, complete with an array of dishwashers and ovens, and funky Smeg fridges full of ice cold bubbly, which was flowing freely. Our next stop was a detour to Scooter Life to check out Vespa scooters, we all want one! Milano Furniture at White Canvas Gallery included a design your own Stephevi rug competition, which appealed to the artistic ones, along with elegant finger food. Argent’s showroom was packed full of the latest design bathroomware, and they welcomed everyone with drinks and nibbles. Innerspace was a quiet enclave of modern furniture design within its old church exterior. Space was a hive of activity, three floors full of happy people. Of particular note was the 10 year anniversary of the Cero stool by local architect/designer Brian Steendyk, there was also a tribute to the Milan furniture fair. ECC Lighting and Stylecraft were both operating simple pop-up shops in a development site. A standout venue for product design was Luxxbox/Objx, the skateboard deck stools were a winner, along with many other interesting local designs! As the sun was setting on Brisbane Indesign, our team retired to Australian Modern central for cocktails. Over drinks we discussed plans for our next event, a modernist architecture and design (M.A.D) weekend, Friday 29 and Saturday 30 June, also Sunday 1 July. Put those dates in your diary, the program will be announced shortly and bookings are essential.